Recent political and social developments in Austria have been widely portrayed in simplistically metonymic terms, with controversial figures such as Waldheim and Haider being perceived to epitomise Austrian society as a whole. In this paper, I analyse the discursive/lyrical content of some of the songs by STS and Austria 3, two of the most successful bands within the genre of Austrian popular music. Approaching these two case studies from the theoretical perspectives of discourse analysis and cognitive anthropology, I will show that 'Austro- Pop' has - at important junctures in recent Austrian history - served as a tool of ideological resistance and created sites of social critique and cultural introspection. This paper thus illustrates that popular music analysed as discourse can draw attention to social heterogeneity and competing ideologies. The resulting sociological account challenges widespread portrayals - both journalistic and academic - of Austrian society as ideologically monolithic. Popular music will therefore be shown to offer valuable empirical data concerning some important sociological and social psychological issues such as the spread and contestation of ideas, the 'nature' of public opinion and the individual's agency in relation to it. The last twenty years have brought about a considerable shift in outside perceptions of Austrian society and politics. During the 'Kreisky era' of the 1970s and early 1980s, the consensus building model of Austrian politics and its Austro-Keynesianist commitment to social welfare were � by some commentators � regarded as a 'model of perfection' (Fitzmaurice 1991, 1). Several high- profile corruption scandals, the Waldheim affair of 1986, and the gradual rise to power of the Freiheitliche Partei formerly led by the highly controversial J�rg Haider later, Austria's international image has changed drastically. Remarkably, there are widespread tendencies among journalists and academics to regard both eras, the old and the new, in reified and simplistically generalised terms. Dissenting voices, political resistance, cultural contestation and social critique on a grassroot level are largely ignored in favour of a stereotypical picture of Austria as allegedly governed by a powerful and unified national consensus. Not only is such a portrayal sociologically deeply flawed, for it fails to acknowledge the ubiquity of competing discourses and the 'contested nature of culture' (Van der Veer 1994, 196), but it can only explain the transition of the 'old' to the 'new' in terms that deny human agency and portray the electorate as manipulated by consensus building politicians. Such an explanatory model appears to suggest that the recent political rise of the 'right' corresponds to a total shift in public opinion towards xenophobic sentiments and a pan-Austrian revival of an aggressive ethnic nationalism. In this paper, I will problematise such perceptions through an analysis of the discourse of some well-known contributions to Austrian popular music. Read as commentaries on contemporary society and politics, they provide channels of critically engaging with Austria's relationship with its World War II past, its place in the post-Cold War world as well as in an eastwardly expanding European Union. My case studies will highlight the limitations of reifying accounts of what turns out to be, at closer inspection, a highly contested 'social field' (to borrow Max Gluckman's famous anthropological term). By analysing the lyrics to some of the best-known and most popular contributions to the genre of 'Austro-Pop' as ideologically laden cultural texts, I will draw attention to popular music as a potential site of political resistance and medium of cultural critique. This will amount to a deconstruction of metonymic representations of Austria as presented by many Austrian commentators and external observers alike. This discussion will also relate to sociological questions concerning the subject and its 'identity', as well as the relationship between social actors and widely circulating 'frameworks of meaning'. Taken as a whole, this paper represents a preliminary step towards the 'export' of cultural studies � particularly of the ethnographic variety (i.e. reception studies of cultural texts) � to the Central European context. The social theoretical concern with the ideological significance of popular culture (and music in particular) can be traced back to Adorno's dichotomy between 'great art' and the 'culture industry'. While the former was defined by its alleged capacity to reflect social contradictions and 'express alienation' (thus serving as a vehicle of cultural critique), Adorno dismissed the latter as merely 'a product of industrial mass-production (�) driven by the ceaseless requirement of profit, [which] deforms the consciousness of every individual (�) reducing people to membership in a conforming, consuming mass and eroding their capacity for genuine thought or feeling' (Martin 1995, 92). The assumption that popular music � as part of the 'culture industry' � is little more than the expression of a false (consumer) consciousness has been challenged by those who have drawn attention to its ability to voice oppositional ideologies (e.g. Ballantine 1984, Shepherd 1991). Within the Anglo- American context, the counter-hegemonic potential of popular music has been traced from the emergence of rock'n roll as a symptom of youth rebellion in the 1950s, through the 1960s counterculture and punk's 'oppositional politics' of the 70s, to the 'charity rock phenomenon' in the 1980s (Street 1991; Frith 1991). Significantly, several empirically grounded contributions to the emerging field of popular music studies have observed its critical potential in contexts as varied as post-colonial Africa (Collins 1992), contemporary Hawaii (Lewis 1992), and pre-1989 Hungary (Szemere 1991, 1992) as well as the former GDR (Wicke 1992). Other authors have analysed pop/rock music as vehicles of a youth counterculture to the Argentinean military dictatorship between 1976 and 1983 (Vila 1992) as well as in authoritarian China during the 1980s (Brace and Friedlander 1992). Discourse analysis studies language, or indeed 'any common system of signs' (Harr� 1998, 132), as 'social practice' reflecting � and significantly shaped by � social context and existing power structures (Fairclough 1989). It further postulates the existence of socially constructed, historically embedded and widely circulating 'frameworks of meaning' or 'interpretative paradigms' (Potter and Wetherell 1998), on which social actors draw in their ongoing and context-specific construction and interpretation of the 'world'. The subject is thus shown to be firmly located within existing relations of power, which � as Eagleton reminds us � it helps to either reproduce or undermine. Discourse analysis also deconstructs the idea of the 'unitary subject' by revealing that 'diversity and fragmentation are to be expected at an individual level, and that individuals will represent themselves in varying ways according to context' (Marshall 1994, 93). This notion has led to the recognition that people do not construct or interpret the world in only one way, at all times and in all contexts. Instead, social actors are conceptualised as drawing on contextually varying 'interpretative repertoires'. While the notions of 'interpretative repertoires' and of the discursively fragmented subject will inform parts of my analysis, working definitions for the connection between discourse and power (Fairclough 1989, Eagleton 1996) � and the implicated notions of ideology and hegemony � remain to be established. In this article, I will take ideology neither in its 'traditional sense' (as a supposedly 'coherent belief system') nor in its conventional Marxist sense as a bourgeois tool for the reproduction of capitalist relations of production. Instead, I will refer to 'ideology' as both language and 'behavioural practice' (Augoustinos 1998, 166ff.) which help to either reproduce or undermine existing power relations. This inter-links with the Gramscian concept of hegemony, which will here be re-appropriated and thought of as the cultural/intellectual leadership of dominant groups within the 'imagined community' (Anderson 1983) of the 'Austrian nation', serving to maintain existing structures of power. This hegemony, as will be shown, is by no means uncontested. Following Harr� then, ideology constitutes a subset of the larger conceptual category 'discourse' (1998, 134) and will here be thought of as either hegemonic or counter-hegemonic. The cultural texts analysed will be shown to utilise distinctly counter-hegemonic 'interpretative frameworks'. As shown by scholars within the field of cultural studies, however, the 'ideological articulation' of such discourses is a matter of contingency and their 'effects' dependent on their reception/decoding by 'the audience' (e.g.Abercrombie 1990, Ang 1996, Hall 1980, Martin 1995, Morley 1980). In this article, I shall focus on the lyrical/discursive content of a selection of songs by two well-known and successful representatives of 'Austro-Pop'. Firstly, a twenty-year old band from Graz, Austria's second biggest city, which takes its name � STS � from the respective first letters of its three constitutive members' surnames. STS first built their reputation in the first half of the 1980s with Austrian-German cover versions of several Beatles songs, and � more famously � with a song named after the Styrian town of F�rstenfeld (1984). Telling the story of a young musician's disillusionment with cosmopolitan Vienna, its lyrics constituted a self-confident assertion and celebration of a local, provincial identity. Plausibly decoded as a critical engagement with politically and culturally centralist tendencies and a statement in favour of increased federalism, this was but the first of a series of distinctly political songs STS were to release over the years. By analysing some of their later songs in their wider social and political contexts, I will illustrate that they constituted instances of cultural critique and introspection and created sites of political resistance at crucial points in recent Austrian history. The second case-study is provided by a more recently formed band known as Austria 3, which has brought together three Viennese artists with long-standing and (largely) very successful musical careers: Rainhard Fendrich, Wolfgang Ambros and Georg Danzer. In the shape of their joint musical reinvention or reincarnation, Austria 3 have re-released songs previously written, released and performed individually by its three members. Already politically vocal in their earlier (individual) careers, Austria 3 have � as this analysis will show � contextually re-appropriated some of their older songs to contribute to the highly politicised Austrian cultural 'climate' of the last few years. A distinctly political consciousness is revealed in Georg Danzer's statement � quoted on the inside of the cover to one of their three joint albums released to date (Danzer 1998) � that 'it is the artist's obligation to speak up when others have been silenced' (Es ist die Aufgabe des K�nstlers, dort 'Au weh' zu schreien, wo andere schon mundtot gemacht worden sind). Both bands and some of their respective songs will be analysed against the background of contemporary Austrian social and political conflicts. The last twenty years in Austrian history have been marked by two widely documented points of crisis, which brought Austria into international disrepute and created considerable amounts of controversy and tension in the 'Alpine Republic' as well as on a more European or global level. The first of those points of crisis was brought about by the presidential election of Kurt Waldheim in 1986, whose (alleged) Nazi-past caused international uproar and widespread discussions about Austria's (un)willingness to acknowledge and come to terms with its role in the Holocaust and World War II (e.g. Mitten 1992, Menasse 2000). The formation of a new coalition government in February 2000, involving the nationalist Freiheitliche Partei and the conservative �VP (as the second and third biggest parties respectively) triggered the second point of crisis. Not only was this the first time that the social democrats (SP�) found themselves in the role of parliamentary opposition for 30 years, but the former populist leader of the Freiheitliche Partei, J�rg Haider, had acquired an international pariah status through numerous xenophobic statements as well as a number of � at best � highly insensitive comments on the employment policies of the Third Reich (Wodak 2000, 187). The EU reacted with a series of sanctions on Austria, which appeared to increasingly polarise 'public opinion' into a defensive, nationalist lager and a pro-European, anti-Haider camp respectively. While such a representation is in danger of caricaturing people's often far more fluid and contextually negotiated reactions, it nonetheless captures two contrasting moods and competing constructions of European politics which characterised public debate in Austria for much of 2000 until the EU sanctions were lifted. Although the attention of the world press has moved elsewhere since, internal debates continue and political resistance to the current government is perhaps most clearly symbolised by weekly Thursday night demonstrations that started in February 2000 and still continue at the time of writing, though the number of participants has decreased considerably. Of significance to this paper as well as to the sociological literature on Austria is the fact that the events of 2000 can only be understood against the background of the previous fifteen years of Austrian history, particularly the end of the Cold War and its socio-economic impact on Austria in its geographical location on the brink of the former Iron Curtain. Several other factors also combined in bringing about an at least partial redefinition of Austria's political culture and changing social landscape. Firstly, the previous 'large coalition' between the SP� and the �VP was hit by a succession of corruption scandals, which provided Haider with reliable (and vote- winning) points of attack. Revelations of mismanagement and nepotism fuelled a growing discontent, particularly � though by no means exclusively � among working class voters, with the consensus building politics of the 'social partnership' and its Proporz mentality that had shaped Austria's post-war history (Fitzmaurice 1991, Menasse 2000, Pelinka 2000). Secondly, Austria's joining of the EU in January 1995 significantly altered the wider political parameters and reopened discussions concerning her neutrality as 'enshrined' in the State Treaty of 1955. It is not unreasonable to suggest that both the end of the Cold War and EU membership have presented fundamentally altered conditions in which concepts of national identity have been redefined and negotiated. Thirdly, demographic changes in the post-Cold War period, particularly growing numbers of immigrants and refugees from Eastern Europe, have provided a fertile breeding ground for reactionary and nationalist sentiments, which J�rg Haider has exploited politically. Depending on the time publication, such is the tone of much academic writing on recent Austrian history (Sully 1990; Fitzmaurice 1991; Mitten 1992, Brook-Shepherd 1997, Rauscher 2000). Useful and partly illuminating though such accounts undoubtedly are, they tend to present a top-down view of Austrian politics and society as shaped by external factors, individual politicians and their scandals, and an allegedly universal reluctance to confront the dark chapter of Austria's Nazi past. As the following case studies will demonstrate, a study of popular music can provide a complementary, bottom-up view that testifies to the existence of counter-hegemonic discourses and provides a more subtle and differentiated sociological account. Following their success with the above-mentioned release F�rstenfeld (1984), two of STS's most acclaimed songs during the 1980s conveyed a distinct sense of political apathy and escapism. The former, entitled Kalt und k�lter (1985), constituted a nostalgic longing for youthful emotions, eroded since by the trappings of a comfortable � and stereotypically Austrian � middle-class existence and a looming midlife crisis. The second song, entitled Irgendwann bleib i dann dort (1985), articulated the intention to leave Austria and settle in Greece in the not so distant future. On one level, this release was undoubtedly part of one of the band member's ongoing love affair with the Mediterranean world, but it also expressed a distinct sense of disillusionment with Austrian society portrayed in rather bleak terms. However, despite such expressions of seeming disinterest, STS were pushed into political activism by the Chernobyl nuclear disaster in the spring of 1986 and released a song � Unsere Kinder san dran (1988) � critical of nuclear power and very much 'in tune' with a growing environmental consciousness in Austria during the 1980s. 1986 was not only the year of Chernobyl, but also a year of political upheaval in Austria. The scandal ridden, 'small' SP�-FP� coalition government collapsed, J�rg Haider's becoming party leader symbolised the FP�'s ideological shift � or rather return � from a broadly liberal to a distinctly nationalist party (Fitzmaurice 1991, 109), and it was the year of Kurt Waldheim's successful (and fateful) candidacy for Austrian presidency. The international controversy surrounding Waldheim's 'duties' in the German army in the Balkans and Greece during World War II have been discussed comprehensively by Mitten. Importantly, he draws attention to how widespread Austrian reactions in support of Waldheim, as well as much of the (tabloid) media discourse on the issue, rekindled anti-Semitic prejudice and revealed a chronic inability or unwillingness to confront Austria's role in the horrors of World War II (Mitten 1992). Hermann Langbein, an Auschwitz survivor who returned to Austria after the liberation and dedicated his life to the project of Austrian Vergangenheitsbew�ltigung (coming to terms with the [Nazi] past), similarly speaks of the Waldheim affair of 1986 as a 'grausame Ern�chterung' (gruesome awakening) to the realities of what he calls the '�sterreichische Lebensl�ge' or Austrian (self) delusion (Langbein 1987, 13-16). The content of this 'national lie' � in discourse analytical terms seen as a widely circulating 'framework of meaning' � may be summarised as the historical (mis)construction of Austria as 'Hitler's first victim' (aided by a highly selective reading of the Moscow declaration of 1943) and the strategic amnesia concerning the well-documented enthusiasm displayed by many thousands of Austrians over the Anschluss to Hitler's Germany in 1938, as well as the atrocities committed by Austrian perpetrators of the Holocaust. Several authors (e.g. Fitzmaurice 1991, Sully 1990) have demonstrated that this construction of history (and the act of selective remembering it implies) played a significant role in the political, economic and social reconstruction of Austria in the immediate post-war era. Looking ahead, establishing a political consensus to avoid re-kindling the centrifugal and destructive forces that had thrown the first Austrian republic into political chaos in the 1930s, and re-integrating several hundred thousand former Nazis became the main objectives of a new political culture after the end of World War II. Some Austrian commentators take a decidedly more critical view when they speak of the 'politics of a wrong taboo' (Pelinka 2000) or 'the Austrian art of [historical] repression' (Rauscher 2000, 23). Forty years on, international reactions to Waldheim's nomination and election for presidency forced Austria to confront its darkest historical chapter. Undoubtedly, a discourse widely circulating in Austria at the time reproduced and legitimated Waldheim's denials of personal responsibility and his claims not to remember any personal involvement in, or knowledge of, the killing of Partisans in the Balkans or in the deportation of Greek Jews. However, some of the implications of the sociological narrative written by some academics, both Austrian and non- Austrian, are problematic for the very reasons mentioned at the beginning of this article. 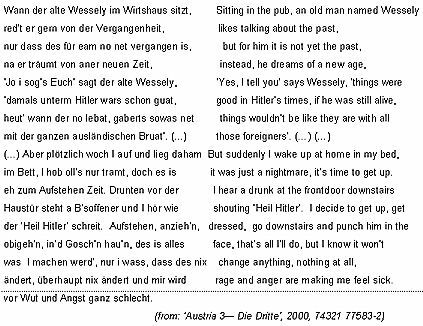 Sully, to name one relevant example, portrays a speech held by Franz Vranitzky � the Austrian chancellor at the time � in 1988 on the occasion of the 50 year 'anniversary' of the Anschluss as the first acknowledgement of Austria's dual role in World War II, as both perpetrator and victim (1990). Writing as critical Austrian historians/political scientists, Anton Pelinka and Erika Weinzierl implied a year earlier that their attempts to critically engage with Austria's past and present were solitary projects in a wider context of national forgetting and denial different from the German willingness to confront the past and grieve for the victims of the Holocaust (Pelinka and Weinzierl 1987, 7). Historical amnesia and selective remembering were, and still are, common. However, cultural critique and political resistance have never been the sole prerogative or the independent invention of a progressive chancellor or a few isolated academics. 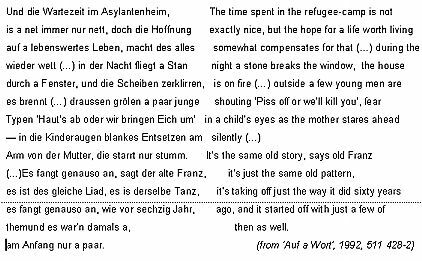 A look at the lyrics of some STS songs from the second half of the 1980s until the late 1990s reveals repeated attempts to critically engage with, and challenge, Austria's myth of World War II innocence. In other words, theirs has been an often counter-hegemonic discourse challenging some widely circulating (mis)constructions of history. 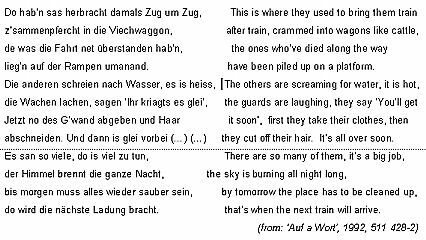 While these lyrics may be interpreted as still entailing the construction of a rather distant 'other' � reflected in Holocaust victims being referred to as 'they' � another song uses the decidedly more inclusive terms 'neighbours' and 'people'. In Wo san all die Menschen hin?, the preliminary step of forcing Jewish families out of their homes, into ghettos and later into trains bound for Auschwitz-Birkenau, Dachau, Mauthausen and other death camps is discussed. Along with an attempt to address the indescribable horror of the gas chambers and the systematic annihilation of millions of people, the song asks a further important question: how can so many people still claim not to have known anything, when their neighbours simply 'disappeared'? Clearly then, this song challenges what we may call the 'myth of Aryan Austrianess' and related essentialist understandings of Austrian ethnicity as defined in opposition to 'Slavic' and other 'non- Germanic' peoples. By underlining and celebrating the social and historical realities � rooted in and going back to the times of the Habsburg empire � of cultural diffusion and ethnic exogamy, STS articulate a multicultural vision of Austrian society that challenges some relatively widely circulating pan-Germanic (and often xenophobic) ideas frequently reproduced by Haider. 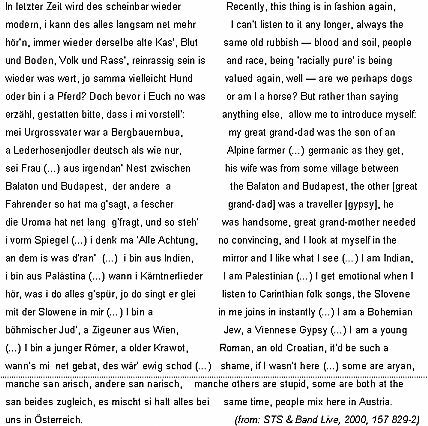 Interestingly, STS corroborated this interpretation and their counter-hegemonic intentions (in an inadvertent act of triangulation) � at a concert in Graz (18 December 2001) months after the first draft of this article had been completed � by introducing this song as 'our Austrian consciousness very different from that of certain politicians in this country'. At the same time, STS thus contribute to a tradition of cultural critique largely ignored by academic commentators and the international media alike. In sociological terms, I bin aus �sterreich supports the now widespread recognition that identities are socially constructed and negotiated, whilst defining nationality in more inclusive, territorial � rather than in exclusivist, ethnic or 'racial' � terms. This song � along with several others released by STS over the years � reveal the workings and articulation of a critical, counter-hegemonic discourse outside the spheres of academia or the public relations exercises of politicians. Ethnic nationalism and an unwillingness to acknowledge Austria's role in World War II provide snapshots of certain ideological tendencies, but by no means a comprehensive account of Austrian society as a whole. An analysis of the discourse articulated by the popular music of STS suggests that a complementary, more ethnographic or 'bottom-up' account can compensate for the methodological and epistemological limitations of deducing a 'national consensus' from election results and tabloid newspaper coverage in a straightforward manner. Mitten has argued that 'the Waldheim campaign appealed to the anti-Semitic prejudices of Austrian voters' and that Waldheim himself 'became the symbol of a wounded national pride and the exponent of a rhetorical provincialism and primitive national chauvinism' (Mitten 1992, 6; 4). Both observation capture disconcerting trends in Austria at the time (as today), as the success of Waldheim's campaign showed. However, as sociologists we ought to be more than wary of such totalising narratives that fail to acknowledge the existence of ideological resistance and the workings of counter-hegemony. STS provide us with empirical evidence supporting the claim that (Austrian) 'culture' is contested and characterised by competing discourses. The discourse analytical notion of socially constructed and historically embedded 'interpretative frameworks' has the added advantage of locating ideas in their wider contexts rather than reducing them to the individual(s) articulating them at any one point in time. Haider's xenophobic nationalism, as argued by numerous commentators (e.g. Menasse 2000, Rauscher 2000, Wodak 2000, Pelinka 2000), has found an audience precisely because it utilises pre-existing frameworks of meaning. Similarly, the counter-hegemonic discourses discussed here borrow from and echo critical attitudes which similarly 'circulate' more widely and are particularly associated with well-known contributions to Austrian literature (e.g. Aichinger 1998, Hackl 1998, Handke 1972, Haslinger 1995, Jelinek 1985, Roth 1996, Turrini 2001, Wolfgruber 1998). Interestingly, the lyrics to I bin aus �sterreich thus also appear to reproduce what has been described � in the context of Austrian literature � as the 'Habsburg myth' or 'the supra-national utopia of peaceful co-existence' (Fliedl 1998, 197). 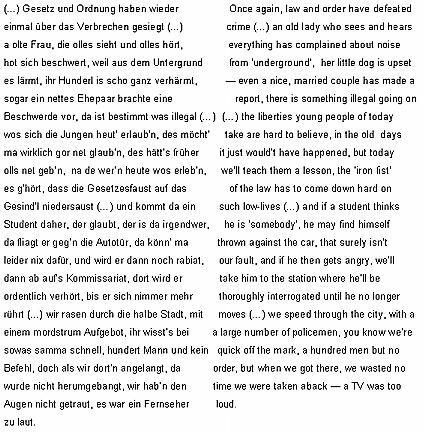 Returning to the focus of this article, however, STS provide not the only site of cultural critique through the medium of Austrian popular music, as our second case study � to which we now turn � reveals. While in some ways comparable to what has elsewhere been observed as pop's contemporary 'spirit of social concern' (Street 1991, 322), we here encounter a political engagement different from what Garofalo has termed 'artist involvement' and 'mobilisation' in the context of the charity rock phenomenon (Street 1991, 32-4). Austria 3 have dedicated part of their recent careers to fund- and consciousness raising for homeless charities. Yet, the closing lines to Der alte Wessely � like some of the songs by STS � convey a distinct sense of disbelief in the effectiveness of social/political activism as well as a sense of dis-empowerment. Interestingly, a remarkably similar sub-text of necessary � yet ultimately futile � political resistance has been detected in the plays of the late Austrian writer Thomas Bernhard (Saville 1999). In discourse analytical terms then, it appears that both STS and Austria 3 selectively also draw on a rather cynical 'interpretative paradigm', which advocates social activism while simultaneously questioning the very possibility of change. The picture emerging thus far is one of critical, counter-hegemonic 'frameworks of meaning' being drawn upon by STS and Austria 3 in some of their respective contributions to 'Austro-Pop'. As such, they reveal the inadequacies of metonymic representations, whereby 'one easy-to-perceive and well-understood aspect of something [i.e. Waldheim, Haider] is used to stand for the thing [i.e. Austria] as a whole' (Lakoff 1987, 77). References to 'Haider's Austria' (Menasse 2000, 18), 'Austrian xenophobia' (Rauscher 2000, 38), 'Austria's island mentality' (Brook-Shepherd 1997, 445), or to Waldheim as epitomising 'homo austriacus' (Mitten 1992) contain elements of such metonymic thinking. In the process, parts of contemporary Austria are (mis-)portrayed as representative of the whole. The cultural texts analysed here reflect counter-hegemonic activities and reveal the sociological inaccuracies of such metonymic caricatures, which allow for little or no discursive contestation and presuppose a national consensus or 'mentality'. It may appear tempting to replace such accounts with a classification of the Austrian populace into nationalist (or ideologically dominated) and counter-hegemonic (critical or resisting) social actors respectively. However, 'Austro-Pop's' selective borrowing of the just mentioned cynical, disillusioned, and resigned 'frameworks of meaning' suggests that such a dichotomy would be overly static and similarly simplistic. In other words, the 'nature' of people's ideological orientations and their identities appear to require further investigation. How are we to reconcile such unfaltering loyalty and unconditional love for Austria as expressed here with Fendrich's history of cultural critique through popular music discussed earlier? The easy answer would be to simply point out that patriotism and critical thinking are by no means mutually exclusive. On one level it is undoubtedly true that people can be patriotic and, in a different context, reflect critically on the society they live in. At the same time, the difference between patriotism and a commitment to xenophobically nationalist sentiments has to be remembered. I am from Austria may not be a concession to the narrow, ethnic nationalism usually associated with Haider and does therefore not necessarily contradict Austria 3's anti-FP� sentiments analysed above. Instead, this song may be more meaningfully interpreted as an expression of what has been termed the 'spell of nationalism' (McCrone 1998, 84), referring to a deeply felt emotional attachment to one's country or region of origin that does not inevitably translate into exclusivist thinking or xenophobia. To accuse Fendrich or Austria 3 of the latter would � in light of the analysis presented above � indeed be inappropriate. 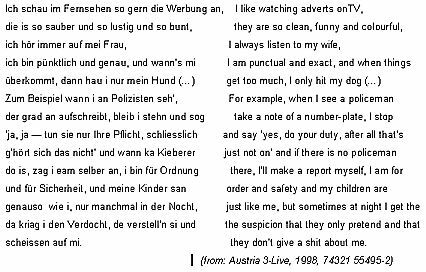 On another level, however, there is more of sociological significance to be said about the lyrics to I am from Austria, particularly its two opening lines. Two of the key- assumptions of discourse analysis mentioned earlier � the 'deconstruction of the unitary subject' and the notion of '[interpretative] repertoires (�) conceptualised not as originating from the individual but as culturally and historically embedded and socially communicated' (Marshall 1994, 93) � can advance our analysis. The questions to ask then are the following: which 'shared systems of meaning' are used in this particular social text and what are its sociological implications? 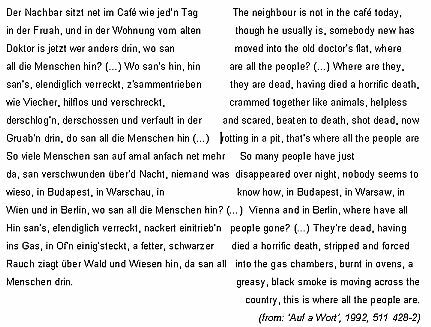 The opening lines to I am from Austria, undoubtedly one of the five most widely known songs of the genre, read in their English translation (as pointed out earlier) � 'Your golden age has long passed, and you've also experienced hell'. It is not particularly difficult to 'guess' which two historical periods are here alluded to: the Habsburg empire as a time of power and 'glory' (i.e. 'your golden age') and World War II (i.e. 'hell') respectively. Both ideas are � in discourse analytical terms � socially communicated and widely circulating 'interpretative repertoires', through which Austrian history is frequently interpreted and constructed and on which Fendrich (and Austria 3 in their re-release) here draw. In other words, this view of Austrian history did certainly not originate in Fendrich's pen, but was borrowed as a widely circulating discourse, as 'a shared system of meanings' used to make history intelligible. As such, it also very much appears to reproduce the earlier mentioned selective reading of the Moscow declaration of 1943 and the derived view of Austria as Hitler's first victim. More critically, it could have been pointed out that Austria did not only experience, but that it also contributed substantially to the hell of WW II. The lack of explicit acknowledgement of such an active role in 'hell' may strike us as a surprise, given Fendrich's and Austria 3's highly critical positions adopted elsewhere and analysed above, including some significant contributions to the ongoing 'project' of Vergangenheitsbew�ltigung. However, the discourse analytical 'deconstruction of the unitary subject' and its reconceptualisation as fragmented and as drawing contextually on different, not necessarily mutually consistent discourses allows us to account for such discursive fluidity. Seen from this perspective, there is no contradiction between Austria 3 expressing disgust over xenophobic sentiments and challenging Haider's politics on one hand, and reproducing a ('conventional') historical narrative that portrays Austria as a passive victim in WW II on the other. Further undermining widespread perceptions of contemporary Austrian society as ideologically monolithic, we thus detect the co-existence of different discourses even on the level of an individual's (i.e. Fendrich's) or a group's (i.e. Austria 3's) ongoing and contextually varying constructions of reality. The idea of an easily categorised subject as either ideologically dominated or resisting therefore appears to become redundant. STS's oscillation between political apathy and activism could be added as further evidence for this argument. Interpreting 'Austro-Pop' through the discourse analytical lens of the 'deconstruction of the unitary subject', such ideological contestation has been shown to occur not only in the general realm of popular culture, but also within individuals' contributions to it. In drawing on 'interpretative repertoires' critical of Waldheim, Haider and their legitimating nationalist ideologies, STS and Austria 3 have been shown to contribute to counter-hegemonic activities in contemporary Austria. Such activity in turn reveals the inadequacies of metonymic representations of Austria, which have constituted my points of departure and attack in this article. However, the same artists also 'switch' repertoires contextually and selectively reproduce the much-discussed myths of Austrian innocence/victimisation/passivity during World War II. Simon Frith has defined 'the creation of identity' as a social function of popular music (Frith 1996, 144). Given such elements of ideological fluidity in the case of 'Austro-Pop' then, it would be misleading to conclude that it constructs a consistently counter-hegemonic identity. Although many of the lyrics of STS and Austria 3 criticise and challenge existing relations of power and the ideas that serve to reproduce them, their own identities also appear to be � in line with much recent sociological theorising (e.g. Battaglia 1999, Hall 1996) � contingent, multiple, and contextually constructed/negotiated. In discussing ideologically dominated and resisting identities in contemporary Austria, we are thus well-advised to remember Stuart Hall' s processual definition of identities as merely contextual or temporary 'points of articulation' between 'discursive practices' and the subject positions they construct (Hall 1996, 4ff.). This article has focused on the 'encoding' of ideological messages of a distinctly counter-hegemonic nature � in the context of the 'Waldheim controversy' and the FP�'s gradual rise to power � in some of the best-known examples of 'Austro-Pop'. As Abercrombie (1990) has pointed out, however, the connection between cultural texts and their 'ideological effects' on the audience is contingent and unpredictable. This echoes Stuart Hall's famous 'encoding/(negotiated or oppositional) decoding' distinction (Hall 1980) as well as much subsequent work in the field of cultural studies (e.g. Morley 1980, Fiske 1987, Ang 1996). Much of this work (particularly in the shape of 'audience ethnographies') has established that meaning � rather than being inherent in texts � is constructed/negotiated by an active audience as part of a 'cultural struggle'. These insights are of two-fold significance to this article. Firstly, they suggest that the sociological analysis of cultural texts is itself part of the ongoing construction of (ideological) meaning. Secondly, they underline that the argument presented in this article is best regarded as groundwork for future research. 'Reception studies' investigating actual decodings and experienced ideological effects (or a lack thereof) by social actors will thus be required to arrive at a more complete understanding of the workings of (counter-) hegemony in contemporary Austria. This article is therefore best regarded as a necessary and preliminary step towards the future 'export' of cultural studies beyond the Anglo- American context and, more specifically, for their use in the Austrian context. The empirical deconstruction of metonymic representations of contemporary Austria should help prepare the ground for such work. The illustration of the 'contested nature' of Austrian culture, the struggle among competing discourses, the reproduction as well as subversion of existing power-relations, the contingent nature of implicated identities, and the deconstruction of the unitary subject add up to a sociological corrective of much existing literature. The merits of applying a discourse analytical framework included the deconstruction of reified accounts of Austrian society as well as of individual social actors and an emphasis on the social(ly constructed) 'nature' of interpretative frameworks, on which (ideologically fragmented) individuals � such as Austria 3 � have been shown to draw selectively and in contextually variable ways. On another level, this analysis of 'Austro-Pop' has provided empirical evidence for Neal Ullestad's assertions that 'all pop is political' (Ullestad 1992, 40ff.) and that, as such, it can be co-opted by the forces of hegemony and � in different contexts or manifestations � serve the purposes of ideological subversion. 1For more critical (Austrian) assessments of the 'social partnership-system', see � for example � Menasse (2000), Pelinka (2000). 2Both bands look back at long and successful musical careers. While there are currently ten STS albums available, Austria 3 have released three joint albums to date (drawing on numerous � individually released � previous ones). The rationale underlying my selection of songs for analysis in this article was to identify texts of relatively clear ideological intent in the context of the aforementioned 'points of crisis'. As will be mentioned in due course, however, the 'successful ideological articulation' of these (or indeed any other) cultural texts cannot be assumed but requires empirical investigation. 3Proporz refers to 'the dividing up of all posts in the public sector between nominees of right and left' (Brook-Shepherd 1997, 385). 4I here follow Felix Kreissler's definition of Vergangenheitsbew�ltigung as a process of analysing Austrian history 'without self-pity' and a growing awareness of the role played by Austrian perpetrators and victims of the Holocaust. Such a historical consciousness is to replace widespread claims not to have been aware of the systematic annihilation of millions of people during WW II (Kreissler 1987, 131). 5Given the highly colloquial nature of most songs within the 'Austro-Pop' genre, literal translations would fail to capture the moods of the songs. All my translations are therefore 'rough' insofar as they aim to reflect the general content rather than presenting exact dictionary equivalents. I have also transcribed all songs in their Austrian-German vernacular, instead of misrepresenting them through translations into 'official' or 'high' German. 6The Jewish cemeteries in Vienna and Eisenstadt were vandalised in October 1991 and November 1992. Starting in December 1993, a series of letter-bomb attacks � killing four and injuring ten people � were committed against members of ethnic minorities as well as against people/organisations supporting them (also see Haslinger 1995). The most widely documented case resulted in Helmut Zilk's � Vienna's (social democrat) mayor at the time � loss of a hand. 7Richard Mitten has attempted a summary of the various meanings of the term Gem�tlichkeit as 'that nearly untranslatable Germanic cultural something so inadequately captured by the English conviviality or atmosphere' (Mitten 1992, 3). He may have added 'cosiness' or 'relaxation' as further connotations. Austria 3, 'I am from Austria', Austria 3 Live, BMG. 74321 55495-2. 1998. Austria 3, 'I bin a Knierer', Austria 3 Live, BMG. 74321 55495-2. 1998. Austria 3, 'A erstickter Schrei', Austria 3 � Die Dritte, BMG. 74321 77583- 2. 2000. Austria 3, 'Der alte Wessely', Austria 3 � Die Dritte, BMG. 74321 77583-2. 2000. Rainhard Fendrich, 'Razzia', Und alles ist ganz anders word'n, Polygram. 521 780-2. 1981. STS, 'F�rstenfeld', �berdosis G'f�hl, Polygram. 821 796-2. 1984. STS, 'Kalt und K�lter', Grenzenlos, Polygram. 827 448-2. 1985. STS, 'Irgendwann bleib i dann dort', Grenzenlos, Polygram. 827 448-2. 1985. STS, 'Die Kinder san dran', Auf Tour, amadeo. 837 553-2. 1988. STS, 'I mag das Land', Auf Tour, amadeo. 837 554-2. 1988. STS, 'Das sind die Tag', Auf a Wort, amadeo. 511 428-2. 1992. STS, 'Es fangt genauso an', Auf a Wort, amadeo. 511 428-2. 1992. STS, 'Und es is so sch�n da', Auf a Wort, amadeo. 511 428-2. 1992. STS, 'Wo san all die Menschen hin? ', Auf a Wort, amadeo. 511 428-2. 1992. STS, 'I bin aus �sterreich', STS & Band Live, amadeo. 157 829-2. 2000. ABERCROMBIE, N. Popular Culture and Ideological Effects, in N. Abercrombie, S. Hill and B.S. Turner (editors) (1990) Dominant Ideologies, London: Unwin Hyman, pp. 199-228. AICHINGER, I. Hilfsstelle, in Fliedl, K. (editor) (1998) Das andere �sterreich, M�nchen: dtv. ANDERSON, B. (1983) Imagined Communities, London: Verso. ANG, I. (1996) Living Room Wars: Rethinking Media Audiences for a Postmodern World, London: Routledge. AUGOUSTINOS, M. Social representations and ideology: towards the study of ideological representations, in Flick, U. (editor) (1998) The Psychology of the Social, Cambridge: University Press, pp. 156�169. BALLANTINE, C. (1984) Music and its Social Meanings, New York: Gordon and Breach. BATTAGLIA, D. Towards an Ethics of the Open Subject, in Moore, H.L. (editor) (1999) Anthropological Theory Today, Cambridge: Polity Press. BOEHMER, K. Sociology of music, in Sadie, S. (editor) (1980) The New Grove Dictionary of Music and Musicians, London: Macmillan. BRACE, T. and Friedlander, P. Rock and Roll and the New Long March: Popular Music, Cultural Identity and Political Opposition in the People's Republic of China, in: Garofalo, R. (editor) (1992) Rockin' the Boat: Mass Music and Mass Movements, Boston: South End Press. BROOK-SHEPHERD, G. (1997) The Austrians, London: HarperCollins. COLLINS, J. Some Anti-Hegemonic Aspects of African Popular Music, in Garofalo, R. (editor) (1992) Rockin' the Boat: Mass Music and Mass Movements, Boston: South End Press. EAGLETON, T. (1996) Literary Theory, Oxford: Blackwell. FAIRCLOUGH, N. (1989) Language and Power, London: Longman. FISKE, J. (1987) Television Culture, London: Methuen. FITZMAURICE, J. (1991) Austrian Politics and Society Today, London: Macmillan. FLIEDL, K. Eins nach dem anderen, in Fliedl, K. (editor) (1998) Das andere �sterreich, M�nchen: dtv. FRITH, S. (editor) (1991) World Music, Politics and Social Change, Manchester: Manchester University Press. FRITH, S. Towards an Aesthetic of Popular Music, in Leppert, R. and McClary (editors) (1996) Music and Society: The Politics of Composition, Performance and Reception, Cambridge: University Press. GAROFALO, R. Introduction, in Garofalo, R. (editor) (1992) Rockin' the Boat: Mass Music and Mass Movements, Boston: South End Press. HACKL, E. Herr Meisel und seine S�hne, in Fliedl, K. (editor) (1998) Das andere �sterreich, M�nchen: dtv. HALL, S. Encoding/Decoding, in S. Hall et al. (editors) (1980) Culture, Media, Language, London: Hutchinson. HALL, S. Introduction: Who Needs Identity? in Hall, S. and duGay, P. (editors) (1996) Questions of Cultural Identity, London: Sage Publications. 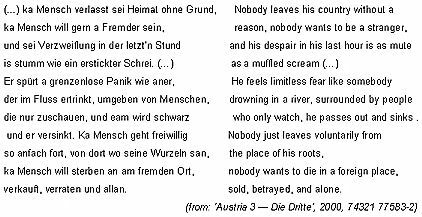 HANDKE, P. (1972) Wunschloses Ungl�ck, Salzburg: Residenz. HARR�, R. The epistemology of social representations, in Flick, U. (editor) (1998) The Psychology of the Social, Cambridge: University Press, pp. 129�137. HASLINGER, J. (1995) Politik der Gef�hle, Frankfurt: Fischer. HAUER, N. NS-Trauma und kein Ende, in A. Pelinka, E. Weinzierl (editors (1987) Das Grosse Tabu: �sterreichs Umgang mit seiner Vergangenheit, Verlag der �sterreichischen Staatsdruckerei: Edition S, pp. 28�41. JELINEK, E. (1985) Die Ausgesperrten, Reinbek: Rowohlt. KREISSLER,F. Nationswerdung und Trauerarbeit, in A. Pelinka, E. Weinzierl (editors) (1987) Das Grosse Tabu: �sterreichs Umgang mit seiner Vergangenheit, Verlag der �sterreichischen Staatsdruckerei: Edition S, pp. 127�142. LAKOFF, G. (1987) Women, Fire, and Dangerous Things, Chicago: University of Chicago Press. LANGBEIN, H. Darf man vergessen? in A. Pelinka, E. Weinzierl (editors) (1987) Das Grosse Tabu: �sterreichs Umgang mit seiner Vergangenheit, Verlag der �sterreichischen Staatsdruckerei: Edition S, pp. 8�16. LEWIS, G.H. Don' Go Down Waikiki: Social Protest and Popular Music in Hawaii, in Garofalo, R. (editor) (1992) Rockin' the Boat: Mass Music and Mass Movements, Boston: South End Press. MARSHALL, H. Discourse analysis in an occupational context, in C. Cassell, G. Symon (editors) (1994) Qualitative Methods in Organizational Research, London: Sage Publications, pp.91�106. MARTIN, P. (1995) Sounds and society: Themes in the sociology of music, Manchester: Manchester University Press. MENASSE, R. (2000) Erkl�r mir �sterrreich, Frankfurt: Suhrkamp. MITTEN, R. (1992) The Politics of Antisemitic Prejudice: The Waldheim Phenomenon in Austria, Oxford: Westview Press. MORLEY, D. (1980) The 'Nationwide' Audience, London: British Film Institute. PELINKA, A. and WEINZIERL, E. Vorwort, in A. Pelinka, E. Weinzierl (editors) (1987) Das Grosse Tabu: �sterreichs Umgang mit seiner Vergangenheit, Verlag der �sterreichischen Staatsdruckerei: Edition S, p.7. PELINKA, A. Die rechte Versuchung, in Scharsach, H. (editor) (2000), Haider � �sterreich und die rechte Versuchung, Reinbek: Rowohlt, pp. 46-66. POTTER, J. and Wetherell, M. Social representations, discourse analysis, and racism, in Flick, U. (editor) (1998) The Psychology of the Social, Cambridge: University Press, pp. 138-155. RAUSCHER, H. Eine geschlossene Verdr�ngungskette, in Scharsach, H. (editor) (2000) Haider� �sterreich und die rechte Vesuchung, Reinbek: Rowohlt, pp.22-45. ROTH, G. (1996) Das doppelk�pfige �sterreich, Frankfurt: Fischer. SAVILLE, M. (1999) 'Das geliebte, genauso gehasste �sterreich': The Theme of Austria in the Plays of Thomas Bernhard, PhD Thesis: University of Nottingham. SHEPHERD, J. (1991) Music as Social Text, Cambridge: Polity. STREET, J. Youth Culture and the Emergence of Popular Music, in T. Gourvish, A, O'Day (editors) (1991) Britain Since 1945, London: MacMillan. SULLY, M. (1990), A Contemporary History of Austria, London: Routledge. SZEMERE, A. 'I Get Frightened Of My Voice': On Avant-Garde Rock in Hungary, in Frith, S. (editor) (1991) World Music, Politics and Social Change, Manchester: Manchester University Press. SZEMERE, A. The Politics of Marginality: A Rock Musical Subculture in Socialist Hungary in the Early 1980s, in Garofalo, R. (editor) (1992) Rockin' the Boat: Mass Music and Mass Movements, Boston: South End Press. TURRINI, P. (2001) Ich liebe dieses Land, Frankfurt: Suhrkamp. ULLESTAD, N. Diverse Rock Rebellions Subvert Mass Media Hegemony, in Garofalo, R. (editor) (1992) Rockin' the Boat: Mass Music and Mass Movements, Boston: South End Press. VAN der Veer, P. (1994) Religious Nationalism, Berkeley: University of California Press. VILA, P. Rock Nacional and Dictatorship in Argentina, in Garofalo, R. (editor) (1992) Rockin' the Boat: Mass Music and Mass Movements, Boston: South End Press. WALLIS, R. and Malm, K. (1984) Big Sounds from Small Peoples: The Music Industry in Small Countries, London: Constable. WICKE, P. The Times They Are A-Changin': Rock Music and Political Change in East Germany, in Garofalo, R. (editor) (1992) Rockin' the Boat: Mass Music and Mass Movements, Boston: South End Press. WODAK, R. 'Echt, anst�ndig und ordentlich', in Scharsach, H. (editor) (2000) Haider � �sterreich und die rechte Versuchung, Reinbek: Rowohlt, pp. 180- 187. WOLFGRUBER, G. Die Mehrzahl, in Fliedl, K. (editor) (1998) Das andere �sterreich, M�nchen: dtv.